I had this book on my wish list as a "just in case" book. I was surprised when I received it from my wife for Christmas. Since we celebrated early this year I decided to bring it along on our Christmas babysitting vacation (grandkids). While it seemed a bit slow to begin with it soon turned into a compelling story revealing a side of CHS rarely seen. This book helped me to see that while Spurgeon was a great man, he was only a man. It turned him into a human being. The interaction between Thomas Johnson and Spurgeon was second only to David and Jonathan! I do not read very fast and was pleasantly surprised to finish this book well before Christmas (even between diaper changes, etc). The account of the Jubilees of Spurgeon's birthday and Johnson's emancipation was so moving that I found myself weeping at the end of the chapter. I realize this is a somewhat fictional account but I am sure there was adequate research to qualify this as high quality biographical "fiction". 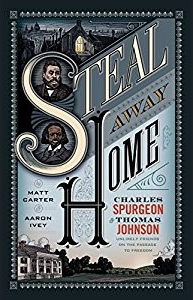 This book has given me a greater comprehension of slavery in the South and a deeper appreciation for my own life and relationship with my wife. Glad to hear it picks up a little later in the book. I almost put it down after a few pages.